A list of Canada Day weekend celebrations, festivals, events, activities & fireworks happening in and around Ottawa. 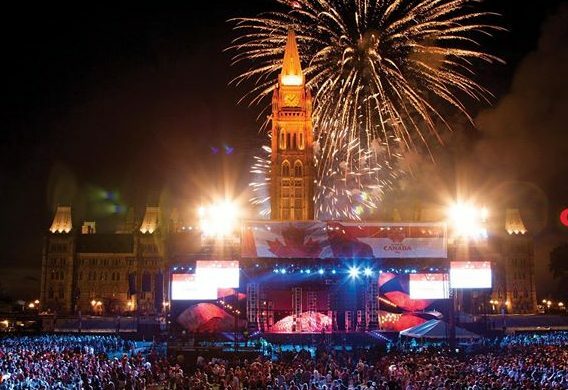 From 15 minute President’s Choice Canada Day Pyromusical Fireworks to free concerts during TD Ottawa Jazz Festival, there are plenty of ways to celebrate! AND if you want a quiet weekend, it is license free fishing days at Ontario Waters! — Please verify all information before travelling. Best views: Canadian Museum of History, Major’s Hill Park and along the Ottawa River. Arkells, Lights, Brigitte Boisjoli, Ruth B, Iskwé, Jean-Marc Couture, Elijah Woods x Jamie Fine, Klô Pelgag, The Dead South, Rose Cousins, DJ Shub, Boogat, A special segment featuring Olympic and Paralympic athletes Kim Boutin, Mikaël Kingsbury, Mollie Jepsen and Brian McKeever. Cultural performances, children’s activities and games, displays, exhibits, escape games, entertainment and more. Join us at the Greely Community Centre this year for a fantastic Canada Day! Free Games, Bouncy Castles, Pony rides, Trolly Rides around the grounds, Free BBQ from 3-6pm, Entertainment and a local student magician is coming! Charity Fries and the Ice Cream truck will be making return visits so get in that line early! There will be a small concession area again as well. 3-6 is a free BBQ hosted by Councillor George Darouze,The Beer Garden is being run by Perth Brewery and will have local musical talent from Kaitlin Deavy (2-4), Osgoode’s Vinny The Ripper (4-6), and Spencer Scharf (6-9pm). There will be many activities for the entire family to enjoy, including “Amazing Race Osgoode”, petting zoo and pony rides, BBQ, children’s activities, fireworks, and more! Details. Shuttle bus: 11:00am to 10:40pm from both Ross’ Independent Grocer and the Heart & Crown. Last bus leaves Ross’ Independent Grocer and the Heart & Crown at 9:00pm. We have a BBQ, live shows, inflatables, petting zoo and pony rides, laser tag, train rides, clowns, balloons, face painting, and so much more!!! It is an event to remember, and definitely not to be missed! Celebrations commence in Riverside Park and include lots of children’s activities and entertainment for all ages. The day long celebration features: live entertainment, Children’s Airbouncers and Games in the Kid’s Zone, delicious food vendors, and much more! The day is topped off with the best fireworks in Lanark County, if not the Valley! Details. On Canada Day, come in out of the sun (or rain) for some family fun activities at the Bank of Canada Museum. This year’s theme is Women on Currency and there’ll be opportunities to learn all about the women who’ve appeared on bank notes and coins both here and around the world. There will also be trivia, origami, a strike-your-own-coin station and a Canada Day tradition at the Museum: free frozen treats for all (but you have to work for it). Details. The Canada Aviation and Space Museum and NAV Canada invite everyone to a great day of fun and entertainment! Celebrate Canada like never before at this country’s premier aerospace museum, with dynamic activities for the whole family. Details. 2018 headliners featured on the Top Shelf Main Stage include Boz Scaggs, Chris Botti, Dee Dee Bridgewater with the Memphis Soulphony “Memphis: Yes, I’m Ready”, Béla Fleck and the Flecktones, and Lake Street Dive. Celebrate CANADA DAY and the nation’s 151st with FREE shows throughout the day on July 1st. Celebrate Canada’s birthday at the Diefenbunker! We’ll have family-friendly activities, a Canada themed scavenger hunt through the entire 4 storey underground Bunker, an obstacle course, and more! This year we are excited to offer Little Ray’s Reptiles, reptile show from 11:00 to 12:00. There will be lizards, snakes, spiders and more! We’ll also have a BBQ with hot dogs and veggie dogs. As well as frozen treats and drinks for an affordable price! 5 per day or $10.00 for 3 days. Children 19 and under are free! 32nd edition of the Scotiabank Canada Day Road Races. 5K and 10K events, a 1.5K Fun Run for kids between 5 and 11, and a 100 Metre Tot Trot for children 4 and under. Details. Date Night on the Wheel on June 29 & 30 | 6 PM – 7 PM or 8 PM – 9 PM @ LOAM Clay Studio Inc. Thanks for collating all the fireworks displays for Canada Day. I relied on it for the one in Dunrobin. Imagine my surprise when driving down Dunrobin Road before the 10 p.m. start that you posted and finding the grand finale in the skies ahead. Signed, Konfused in Kanata, or Disappointed in Dunrobin.